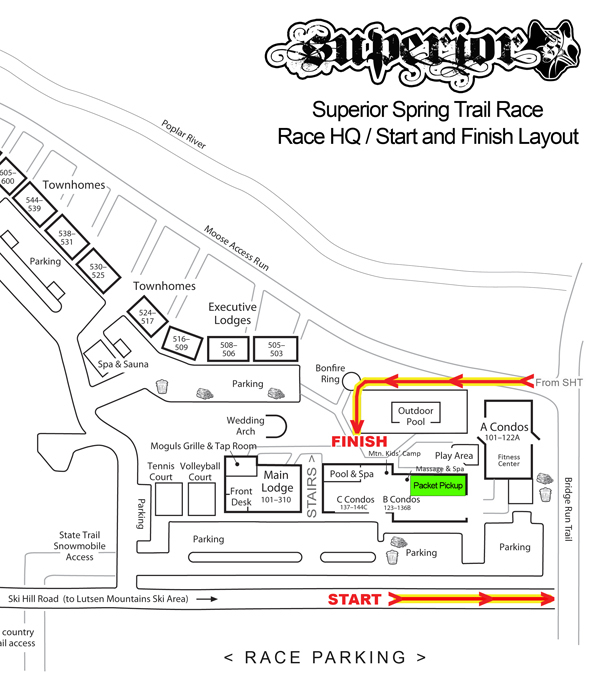 Communal lodging for volunteers is available at Caribou Highlands Townhomes (Lutsen / race finish / race headquarters) on Thursday night for those on the trail marking crew or helping with Setup on Friday and Friday and Saturday nights for all other volunteers. Unit numbers will be available the week of the race and we will email those to you – room assignments will be posted on unit doors, you can go to any unit to review the list and learn which unit you will be staying in. HERE is a Caribou Highlands site map detailing where the townhome units are on the property. This is communal lodging meaning you may share a bunk room or a living room floor with others. We ask that you bring a sleeping bag, sleeping pad and pillow as there may only be floor space available when you are needing to sleep. These are nice modern townhomes near the finish area at Caribou Highlands and there are cooking facilities and showers available for your use. Please clean up after yourself and have your own towel and toiletries if you are going to take shower. Please do not reserve a room or bed for yourself, if you are not going to be there for a while please pack your stuff up and keep it with you, if there is a free bed or bedroom, feel free to use it. A few rooms may be reserved with names on the door – please respect this… it’s usually those folks that are volunteering 5 or more days, a seniority or senior (the old guys / gals) thing! Do not lock the door to the unit, if the door is locked there will be a key under the front door mat, do not take / remove this key – leave it there otherwise people coming in after a volunteer shift could be locked out. Do not leave valuables in the townhome since we will not be locking them. If for some reason you did sign up but are not seeing your name listed on one of the door sheets – please do not panic and contact John or Cheri Storkamp, we will make room for you!